Ukko-Pekka Luukkonen, the Buffalo Sabres' top goalie prospect who led Finland to Gold at the World Junior Championship, will join the Rochester Americans during their push for the Calder Cup. Sabres assistant general manager Randy Sexton announced Friday that Luukkonen will arrive on an amateur tryout for the remainder of the season, though Luukkonen is unlikely to appear in any games since the playoffs begin next weekend. The tryout designation ensures Luukkonen's entry-level contract will not begin until 2019-20. Luukkonen's season with the Ontario Hockey League's Sudbury Wolves ended with a 58-save performance in a 3-2 triple overtime loss to the Ottawa 67's on Thursday night. The 20-year-old led the league with 38 regular-season wins and six shutouts, the former was also a franchise record for Sudbury. A second-round draft pick in 2017, Luukkonen posted a .920 save percentage during 53 regular-season games and a .906 save percentage in eight playoff games, including a first-round sweep of Mississauga. Additionally, Luukkonen posted a 1.80 goals against average and .932 save percentage in six games at the World Junior Championship in Vancouver. His penalty-shot overtime save on Canada captain Maxime Comtois helped Finland survive in the quarterfinals, and Luukkonen stopped USA's Jack Hughes, who many project as the No. 1 pick in the upcoming NHL draft, on a third-period breakaway in the gold medal game. It was redemption for Luukkonen. He posted a 3.13 goals against average and .879 save percentage when Finland finished sixth at last year's tournament in Buffalo. After playing 24 games with LeKi of Finland's tier-two professional league last season, Luukkonen signed an entry-level contract with the Sabres in June and was drafted third overall by Sudbury in the CHL import draft. In preparation for his transition to North American hockey, Luukkonen began practicing on a smaller rink with national team coaches at the Sport Institute of Finland in Vierumaki, the country's Olympic training facility. Luukkonen's time in Rochester will offer him a similar introduction to professional hockey. 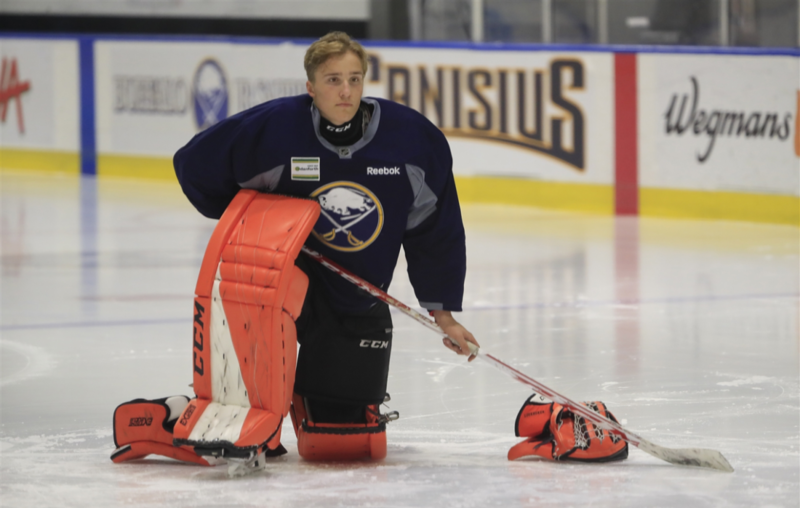 He can continue working with Sabres goalie development coach Seamus Kotyk while becoming acclimated with the team that he'll surely play for next season. Carter Hutton is under contract with the Sabres for two more seasons, while Linus Ullmark is a restricted free agent this summer. Rochester goalies Scott Wedgewood and Adam Wilcox are pending unrestricted free agents, while Cincinnati's Jonas Johansson underwent season-ending surgery on a lower-body injury in February.